You may be shocked, but having a ton more money doesn’t really increase your happiness. At least not by as much as you think it will. 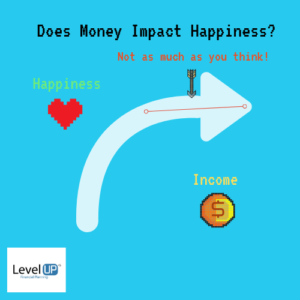 There have been numerous studies and they all have similar findings: At lower income levels when your income increases, there is a dramatic positive change in happiness. What is interesting, however, is that at about $70,000- $80,000 of household income, the amount of happiness from additional income starts to flatten dramatically. In any given year, it is very likely that the money in your bank account does not carry the same value as it did the previous year. Magnify this over multiple years and inflation can have a compounding impact on reducing the value of what a dollar can purchase. One big reason why your larger income now in comparison to a few years ago may not go as far as you think is because it simply doesn’t mean the same thing. Looking ahead 10 years, if inflation were to occur at 3%, about the historical average, a household that currently earns $100,000 would see the purchasing power of this same income be reduced to the equivalent of what $74,409 could purchase today. Another 10 years after that (20 years from now) and the same $100,000 would have the equivalent purchasing power of $55,367. Almost half! So you see, just receiving the standard 2% to 3% pay raises only allows you to keep up with inflation. To truly earn more money when accounting for inflation, you need significantly greater pay raises. Maybe you have earned significant pay increases and you are making a ridiculous amount more than you had in the past. This is indeed a tremendous opportunity for you. Unfortunately, it is one that is often squandered and has the potential to land you in a worse financial position. Unless you are a minimalist, you are likely to upgrade your lifestyle as your pay increases. As you incorporate these upgrades into your life, you create a new baseline for what your “normal” spending is. You will even start to consider these upgrades as a “need”, which will be mentally hard for you to cut should you ever need to in the future. “I will do what I need to do” is probably what you are thinking to yourself and maybe that is the case, but you likely would not make the change quickly. Or if you are like me and have a family, they may be resistant to the changes that are needed to occur. The more income you have, the more financial institutions will be lining up to offer up mortgages, auto loans, and credit cards. Not only will they be lining up, but they will be telling you that you can afford a ridiculous amount in borrowing power. The biggest lifestyle creep expenses occur through leveraging debt. Those big lifestyle expenses occur in the form of a larger home and fancier vehicles that seem very affordable at your CURRENT income. You may even have large credit limits with your credit cards that you carry balances on. Relying on a large income can add a lot of pressure. Do you clock in a ridiculous amount of overtime? Do you have alternative employment prospects if your current role doesn’t last as long as you’d prefer? Do you enjoy your job or are you just really good at it? Personally, it was really hard for me to walk away from my traditional financial planner role that served pre-retirees. My family’s lifestyle had increased dramatically in my four years in financial planning. There was a lot of pressure to stick around for the money so that we wouldn’t have to make adjustments and continue to reap the benefits of a nice income. Feeling the sense that staying for the income and not doing what I felt was right (which was start Level Up Financial Planning) really freaked me out! Within the financial advising world, much of the talk at conferences revolves around how much money each advisor makes or how much money they manage for their clients. I once thought of leaving the whole industry due to some of the characters I had run into at large conferences. There are even a few individuals I know who had changed substantially due to success and the income that came with it. All of the other topics are not necessarily bad if you have a balanced approach to them, but this I can say definitively about this topic, money should never be the goal! If it is, you will never have enough and you will miss out on a lot by chasing it. Do you get paid a ridiculous amount, but you do not love what you do or worse, hate it? Too often this occurs and you may feel stuck. Remember that you always have a choice. It may not always feel like that, but the main reason you feel stuck is because of how you choose to prioritize your financial life and you refuse to make a change on the financial front. With my transition to start Level Up Financial Planning, again, I can relate pretty heavily to this scenario. Many of the choices my wife and I had made previously were something we still had to live with: student loans, larger mortgage, growing family, and new family vehicle. So sometimes you do have to deal with the consequences of your previous life’s financial decisions, but there is still probably 50% or more of your income that is not tied specifically to a pre-existing obligation. You may not be in a place to make drastic changes, but the reality is that you can start to put a plan in motion where you can gain more financial control and confidence by making it a goal to transition in 1-year, 3-year, 5-year, whenever you reach the point. Planning and making the hard choices over the next few years could be the difference of you being insanely happy and super proud of yourself for committing to achieving your goal of transitioning to a more fulfilling career. Unemployment could deal a crippling blow to your financial situation. Could you survive without your income for 1 month? 3 months? 6 months? At which point, would you look at your expenses to see if you can make adjustments? How many payments are fixed as a result of large mortgage or vehicle loans? Your income may be reduced due to less commissions or overtime, or transitioning to new employment. An income reduction is not nearly as devastating as a complete loss of income, but there will still be a shock to your financial situation. An overlooked concern for many is becoming disabled and being unable to fulfill the duties or your current role, a role that you are paid well to perform. This not only has the impact of an unemployment scenario, but it could be extended or even permanent, which makes this risk drastically more dramatic. Life insurance is most important for those who have others that rely on your income. If you were to pass away, then your potential future earnings disappear. You may be surprised by how much coverage you require. Many of my clients require between $500,000 and $1,500,000. You will want to analyze your assets and remaining working years in determining the proper amount of insurance coverage. This sort of ties into lifestyle creep, but focuses more on the future expenses than your current living expenses. Not only does your short-term expenses increase with lifestyle creep, but these expenses persist well into retirement. This persistence of your lifestyle creep expenses the amount of funds needed to fund your retirement. That is if that is the income you need today. Remember the lesson above about inflation? If you are still multiple years from retirement, the amount needed will likely inflate to amount even larger than what the example indicates. I can not stress enough how much spending and your lifestyle expenses impact your future possibilities. Two aspects that are the most important to consider when you are prioritizing your spending habits: Does your purchase really impact your life and add a ton of value? Can you reach your important goals with your current spending habits? If the answer to both of these questions is yes, you are in a rare situation when you compare yourself to most of your peers. If your answer is no, then you may want to schedule a meeting or attempt to implement your own strategy. The next actions below will help you identify major pieces of the puzzle. If you are constantly treading water and living paycheck to paycheck. Your financial life can tank if an emergency scenario ever were to arise. Establishing and monitoring your emergency savings needs will be critical in providing your confidence which will hopefully relieve any stress or anxiety you may have after reading some of the risks above. It is important to monitor because as your pay and expenses increase, the emergency savings should also increase. Otherwise, you are not protected the same way you were at lower income levels. When I approach building a strategy guide with clients, this is usually the first step, but I know many people simply will not take the effort to really ground themselves with what is most important to them and keep their goals at the focus of many of your financial decisions. If you are willing to, you will see a dramatic impact on how much you care about where your money is being spent and establishing an emergency savings. This is where the focus becomes a big benefit to achieving your goals faster and with less stress than if you approach your financial life nonchalantly. Hopefully, you realized when reading through the risk of not having the proper insurance coverage that obtaining the proper insurance is a quick and easy solution to that problem. You want to protect yourself (disability insurance) and your family (life insurance) if your income earning potential were to evaporate or quickly change. Investing for your future helps offset the impacts of both inflation and funding your future retirement spending. There are many ways to approach investing, but when thinking about long-term goals, you want to allow yourself the potential to out-earn inflation. Investing does have the potential for losses, but many of the risks can be mitigated with a long-term focus and diversified approach. Investing in yourself is not only very rewarding because of the personal growth you will see, but also to have more control over your destiny. If you further your knowledge or expertise in your current role, it will open up the opportunity for promotions, pay raises, and job security. If you fall into the category or wanting to make a shift that requires a drop in income, being the most prepared as possible to enter your new role will help you close the income gap faster. If layoffs ever do impact you, you will have greater abilities, strengths, and confidence to identify and land your next opportunity. 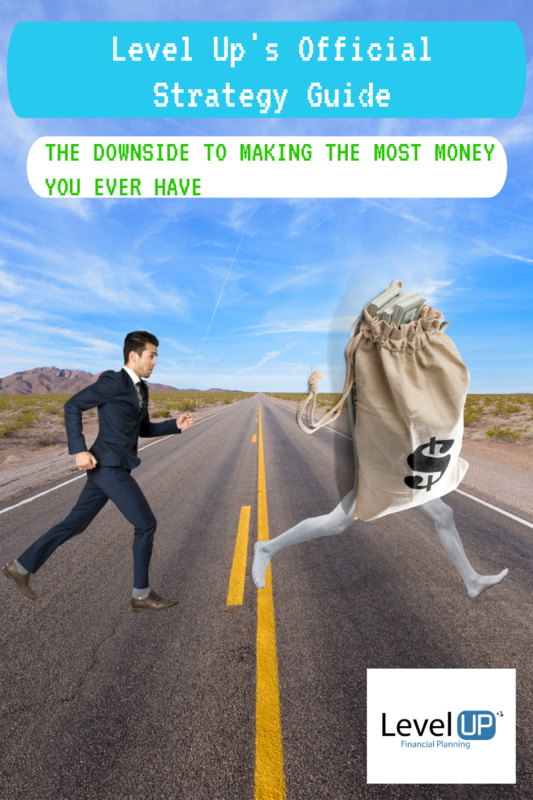 Now, do you believe that there are downsides to making the most money you ever have? The great news is that all of these risks are controllable by the actions and choices that you make. Just think about the flexibility and possibilities that open up if your income increased 25%, but you didn’t increase any of your expenses! You could destroy any debt that you have previously accumulated at light speed. Then what?! Making the most money you ever have is an amazing opportunity, unfortunately, it is one that most people mess up. Don’t mess it up! If you would like to collaborate on a more complete plan, you can schedule a complimentary call today. Want to learn more about personalized Level Up Strategy Guides?